Say what you will about Twilight, but its fans deserved better than the hatchet job of a comic adaptation it received. Encouraged by the burgeoning YA comics market, some publishers have put out hastily adapted comic book versions of successful prose novels that will appeal only to the most die-hard of fans. So it's a relief to see Hope Larson, the cartoonist behind Chiggers, Grey Horses, and Mercury adapting Madeleine L'Engle's classic novel A Wrinkle in Time. 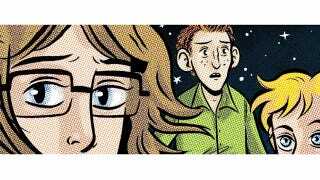 Larson obviously has great affection for the tale of time and space travel, outsiders, and fascism, and she has created a tender graphic novel from it. Although Larson sticks close to L'Engle's original text, hitting all the key notes of Meg, Charles Wallace, and Calvin O'Keefe's journey to fight a shadowy evil, her adaptation is best suited to readers already familiar with A Wrinkle in Time. Without the accompanying prose, Larson's version is an even quicker read than the original, and highlights the rapid clip of the tale. (And then Mrs. Whatsit turns into a centaur thingie, and then they go to Uriel and see the happy medium, and then they go to Camazotz, etc.) But really, a book like this works best when it functions not just as translation but as literary interpretation. Larson understands that she's not just showing us what the Man with Red Eyes looks like or giving us a visual interpretation of tessering; she's also showing us how she reads A Wrinkle in Time. Part of that is, of course, in the character designs. Larson does a particularly beautiful job with Meg Murray, making her physically awkward but giving her moments of sheer loveliness. We're seeing Meg outside of her own head, the way that Larson herself sees her, and Larson gradually makes Meg's movements more deliberate, and finds the innate beauty in her moments of bravery and serenity. Similarly, she gives Mrs. Murray steely good looks that are set off by exhaustion, making Mrs. Murray's resolution and faith in her family even more impressive. Larson's Calvin O'Keefe is certainly not the Gregory Smith version we saw in the terrible Disney adaptation, but the skinny redhead L'Engle describes, a slightly homely but good-natured boy who is uncomfortable with his popularity. And Larson manages to make Charles Wallace, who could easily slip into creepy territory, positively angelic. His unnaturally large eyes make him look just more than human, and Larson grants him an easy certainty that never drifts into smugness. But part of it is Larson's careful attention to L'Engle's themes. The gossip of the Murrays' neighbors gets special attention, as do the small details that make the family resolutely offbeat. Meg's anger and frustration at being asked to conform in her earthly life turn to a righteous embracement of her personal oddities by the end. And the way Larson illustrates the various characters the kids encounter, such as Aunt Beast and the Happy Medium, invite affection for people radically different from ourselves. Where Larson's book really shines, however, is in her own visual language. Many of L'Engle's ideas are difficult to illustrate, but Larson manages to represent Mrs. Which, tessering, and the final confrontation between Meg and Charles Wallace in ways that feel perfectly natural. And if you've seen Larson's other comics, you know she has a real talent for integrating text with her images. Scenes of nature and the travels through space are the strongest in that respect. It seems, though, that Larson couldn't quite decide how to apply this strong visual vocabular on Camazotz. In some places, Camazotz is perfectly stark, but in others, Larson couldn't resist a bit of pretty script or some lovely representational language. Larson's book doesn't serve as a stand-in for the original Wrinkle in Time, and that's what makes it so wonderful. It's a heartfelt tribute to a book she very much loves, one that shares with readers her particular vision of an epic journey and why she so adores the characters who make that journey with us.